The experience that most people have with the healthcare system still is rooted in place as a user or guest. Involvement in the complex and often confusing way healthcare is financed and delivered has been limited to patients presenting themselves at the healthcare provider’s doorstep with known symptoms or a suspected diagnosis. At that point, individuals now are patients with limited engagement in their outcomes, and their expectations of the healthcare system are broadly clinical yet disengaged and uninformed. This is complicated by an often inarticulate way to express patient expectations of what constitutes a positive health experience. The user of the healthcare system is a guest — in it, but not of it. Accordingly, the judgments about its appropriateness are guest-perception-governed: Is the signage adequate, the parking close, the waiting room clean and friendly? The guest experience has been recognized as a fundamental need, and most health systems are doing a good job at making “guest relations” a positive experience. The fundamental weakness is that, as users/guests, individual patients are not actively engaged in their own outcomes. Inadequate understanding of the way healthcare is paid for as a patient or health insurance member further complicates matters. Unexpected charges at the medical care facility, such as coinsurance, copayments or deductible satisfaction, create a confusing financial experience for the patient. The explanation of medical benefits statements further confuses the guest of the healthcare system. Right now, the healthcare system is focused on the current state of how the user/guest interacts with the system, rather than focused on future-state ways of affecting care. This misplacement of focus reinforces the worst aspects of care rather than creating a series of wide-ranging positive interactions. The baseline of how an individual becomes a digital patient is simplistic and easily upset. A health system of providers or payers cannot ignore the fundamental execution of the user/guest experience. Equally, they must understand that these are the so-called “table stakes,” or the price of admission to the digital patient experience. 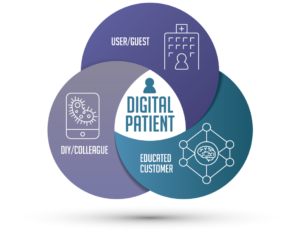 In coming blogs, we will examine more of the attributes of being a digital patient and how to approach solving the healthcare ecosystem’s response to a more complex and demanding audience. Have questions about the digital patient in today’s health system? Contact EC-United Executive Partner Robert H. Booz for more information rhbooz@ec-united.com.